Our house is located in the quiet village of Boreen Point on the shores of Lake Cootharaba 20 kilometres from Noosa Heads and 170 kilometres north of Brisbane. It is an open plan, light-filled modern home with timber floors and modern appliances. There are two double bedrooms, single bathroom, large living area and huge covered northern deck. Enjoy the company of native birds, possums and goannas in our garden and walk to the Apollonian Country Hotel, swimming beach, sailing club and general stores. Swim and sail on the lake, explore the everglades by canoe or boat, and bushwalk in the Cooloola wilderness. It� s only a half hour drive to Noosa beaches and national park, restaurants and craft markets. 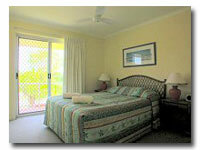 Spacious and simple, the house has two air conditioned bedrooms with one queen sized and two single beds. Cork floors run throughout the walk-in level with one bathroom and an open dining area. There are ramps for easy access. A comfortable living space provides a futon couch that sleeps two and a TV, DVD player and mini hi fi system for leisure pleasure. A large fully equipped kitchen opens onto a deck with views north through the tree tops to the lake, less than one hundred metres away. Woongar St is located on a north facing ridge, above the shores of Lake Cootharaba. A short stroll takes you down to the swimming beach, sailing club and picnic areas. Indulge yourself in a unique lifestyle that is Noosa and enjoy the many activities on the Noosa River at your doorstep. A casual stroll along the river will provide you with facilities like Shopping, Hairdressers, a variety of Restaurants, a Hotel, Boat Hire, River Cruises, Parks and Children's Playgrounds. At Noosa Keys Resort you will be well positioned to take advantage of the boutique shopping and other delights of Hastings Street, or spoil yourself with exquisite world class dining and street cafes. Bask in the sun at one of many beautiful beaches. Enjoy the enchantment of walking through our National Parks.